Make One or Both to Enjoy Every Winter! 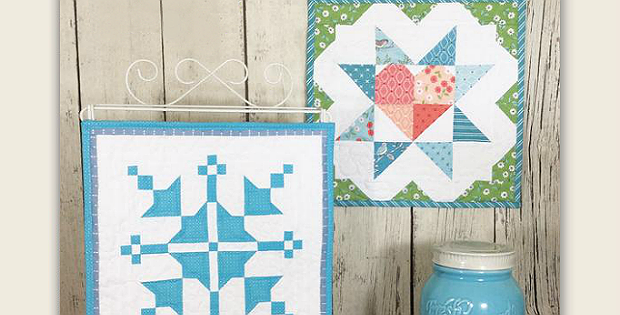 These pretty little quilts are perfect for your winter decor. Choose between the graceful snowflake and the pretty star with a heart. Or, make them both and display the snowflake during January and the heart quilt during February. The soft colors chosen by the designer are simply lovely. However, both quilts will translate very nicely to deeper hues. Plus, since they’re small, you can make them up from scraps and other goodies in your stash. Since each mini quilt is essentially a quilt block, consider combining several for a larger project. For example, three snowflakes sewn end to end would make a charming winter table runner. The finished mini quilts, designed by Sherri K. Falls, are 13″ x 13″. 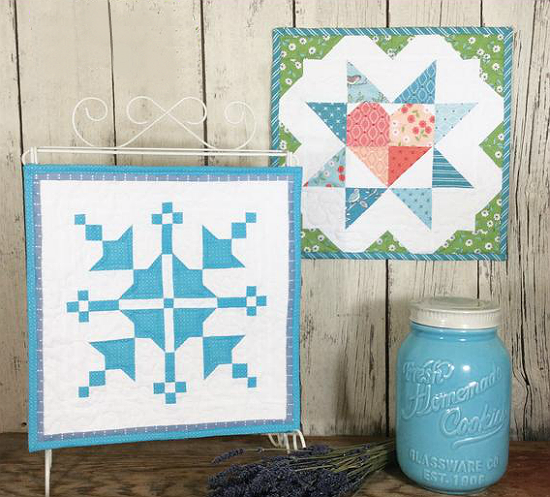 Click here to purchase the “Barn Block Mini Quilt Series January February” pattern. Display your mini quilts on a wall or table. Or, the tabletop quilt stand is available here in a darker color. Spray paint it white if you prefer.